Includes the STS suppressor which will effectively eliminate any vibrations and noise. The only real mention regarding this bow is that the arrows are not included with the package. Hunters need a bow that is fast and powerful, but limited budgets often make it difficult to find exactly what you need. While some models sacrifice performance and speed to keep the price affordable, this is certainly not true of the Lithium Bow from Martin Archery. Capable of producing enough speed and power to take down small and large game, the Lithium Bow delivers an exceptional performance at only a fraction of the cost you would normally except to pay. One of the first aspects to consider is the build of the bow, and you want it to be durable and lightweight. Heavy bows can cause arm fatigue, which can result in missed and wasted shots. Martin Archery has built a compound bow that can withstand the rigors of outdoor hunting, in a lightweight package that is easy to handle. The sturdy construction ensures that the bow will deliver a consistent performance, and it is designed to last for years. The twin X4 limbs provide plenty of speed and stability, while also giving the bow a sleek and professional appeal. The axel measures 33.25 inches, making this a comfortable bow for teens and adults. It also includes the precision machined one piece riser that provides plenty of support for the limbs. The riser is also bridged for added stability. While the bow’s sturdy construction will provide you with the power and speed you need to humanely take down small and large game, the Lithium is also designed to be easy and comfortable to use. It’s lightweight design makes it easy to carry to hunting blinds, and the camouflage print on the limbs lets the bow blend in seamlessly with your surroundings. You will also love the sleek and stylish look of the twin limbs that give the bow a professional appearance that will grow with the user. Martin Archery has designed this compound bow to grow with the archer, and the draw length can be adjusted accordingly. Capable of a draw length ranging from 31 inches to 38 inches, teens and adults can comfortably use this bow on their hunting trips. The Lithium is also designed to be forgiving when shot, and it comes with a 7 inch brace that will help aim and guide your arrows. Designed to give experienced bow hunters the power and speed they need, while still being easy and comfortable to use, this might be exactly what you are looking for. 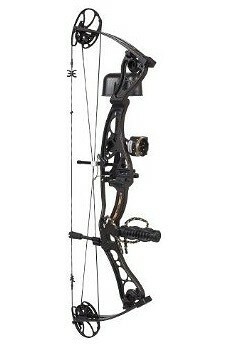 This bow features Nitro 3 cams which are designed to provide you with a smooth and silent draw. The innovative cam system ensures that each draw is nearly effortless so your shots can reach speeds up to 335 feet per second. The smooth and easy draw also helps to eliminate any jerks in the string that can throw off your aim and cause you to waste a shot. The Nitro 3 cams are also adjustable so the bow can easily grow with its user. Simply turn the bolts in the module to adjust the draw to a comfortable length. Unlike similarly priced compound bows the Lithium includes all of the features you need to have a successful hunting trip. The 3 pin and peep sights make it easy to line up your shots with the target, and the package also includes a quiver, rest, loop and sling. With everything but the arrows included you can immediately start hunting right out of the box. What truly impresses hunters with this bow is its nearly silent design. Every aspect of the bow is designed to minimize noise and vibrations so you can enjoy impressive accuracy without startling your prey. The one piece bridged riser is capable of delivering a powerful shot at 335 feet per second that is smooth, silent and accurate. The solid construction eliminates vibrations during the draw and release that can throw off your aim and cause your prey to run away. The riser also features Martin Archery’s patented vibration system, which effectively eliminates any noise. The noise suppression system is constructed from durable and lightweight carbon fiber that will eliminate virtually all sound and vibrations. While the cam system ensures a smooth and easy draw, the STS prevents the bow from making any noise. This also helps improve the accuracy of your shots, since there are not any vibrations that might throw your aim off. If you are looking for a compound bow that is fast and accurate for your next hunting trip, the Lithium from Martin Archery might be exactly what you need. It is affordably priced, and designed to give you the same performance you would expect from a high end model. The smooth Nitro 3 cam ensures a smooth and fast draw and release, and since it is adjustable the bow can be easily used by young and adult archers. The solid one piece bridged riser and twin limbs provide you with plenty of stability, and with speeds up to 335 feet per second this bow can easily keep up with your prey. The Nitro Cam system provides a smooth draw and release and can be easily adjusted depending on the size of the user. This package includes everything you need to have a successful hunting trip.